At Holz-Handwerk in Nuremberg, for the first time LEUCO will be presenting circular saw blades developed for use with magnetic plates. Magnetic panels are currently in high demand at exhibitions, in interior construction, and in shop construction. The material is prized for its very high level of adhesion, combined with the writability of the surfaces and diverse areas of application. 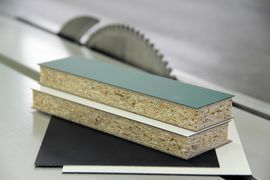 An iron foil 0.2 mm thick embedded in the laminate provides the high level of adhesive force. This layer, however, brings with it a new challenge: Using common HW-tipped circular saw blades for woodworking only allows users to saw magnetic panels in some conditions or with only very low edge lives. At Holz-Handwerk in Nuremberg, for the first time LEUCO will be presenting circular saw blades developed for use with magnetic plates. Starting now, companies have access to a saw blade for chip-free cuts and long edge lives. They are tipped with a highly specialized type of tungsten carbide, and are used alone for trimming cuts in laminate and with a support plate to size materials. Frequently, sawing with common tipped circular saw blades can even cause sparks. To ensure these didn’t become dangerous, users used to have to decouple the machine from the dust extraction. Using the new LEUCO blades, sparks are reduced to a minimum. No special precautions need to be taken when making trimming cuts in magnetic plates. The circular saw blades are available for sizing saws with a 350 mm diameter, as well as a variation for use in horizontal panel sizing saws.